Here I will explain how to create table with primary key in sql server or create table in sql server with primary key and identity or auto increment column with example. By setting column property like “UserID integer PRIMARY KEY IDENTITY” we can create primary key with identity column in sql server. In previous articles I explained create error log files in asp.net, bind countries to dropdownlist in asp.net, SQL Server single procedure to insert update delete, SQL Server take database backup, SQL Server restore database from .bak / .mdf file, Primary key constraint in sql server, foreign key constraint in sql server, cursor example in sql server and many articles relating to SQL server. 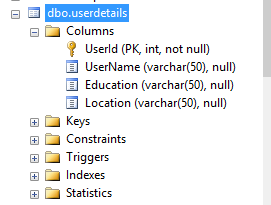 Now I will explain how to create table with primary key and identity column in sql server.